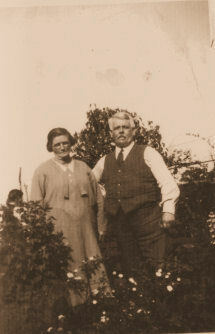 This is Susan Ann Eason with her husband Charles Barrett.Susan was born at Merriot a small village near Crewkerne in Somerset England,on 25th November 1876.She was the eldest daughter of Gideon Eason and Laodimina Osbourne.Susan married Charles Barrett a Webber by trade on July 31st 1897 at Merriott. They set up home in South Street Crewkerne and produced a family of six children. during the "Pitchfork Rebellion", it is believed they changed their name to Eason to evade persecution .